Laura Leslie picks a few of the Austrian Grand Prix's most memorable moments. The hills are alive with the sound of turbos once again, as Formula One rolls into the Austrian mountains for the 30th time. There have been countless memorable moments on three different tracks; BadgerGP picks the best. A downpour prior to qualifying left the field wide open for the 1998 Austrian Grand Prix. A drying track meant those who could be last across the line at the end of the session stood to gain the most. As it was, the last car across the line was the Benetton Playlife of Giancarlo Fisichella. A smooth lap allowed the popular Italian to grab his first career pole just ahead of the Sauber of Jean Alesi. For perspective, their teammates Alexander Wurz and Johnny Herbert lined up 17th and 18th respectively. It would be nearly eight years before Fisichella would take another pole position. A brilliant wet-weather driver left Vittorio Brambilla in the lead of the 1975 Austrian race when it was halted on lap 29. Half points were awarded. It wasn’t the win itself people remember Brambilla for though, but what he did after the checkered flag fell. Busy celebrating his shock victory, Brambilla lost control of his March and crashed into the barrier. The Italian made it back to the pits with his front end rather crooked and gave photographers the chance for a set of photos that have been cherished ever since. The race also proved to be the first time a Welshman stood on an F1 podium thanks to Tom Pryce. No team wants to see their drivers collide during a Grand Prix. Unfortunately that’s exactly what Ron Dennis had to endure at the start of the 1999 Austrian Grand Prix after David Coulthard tapped Mika Hakkinen into a spin on the very first lap. The incident left Hakkinen at the back of the field and Coulthard out in the lead. However it left the Scot exposed to the Ferrari of Eddie Irvine. During the stops, superior strategy saw Irvine leap ahead to take the win. A livid Hakkinen recovered to third. To make matters worse the pair would collide on the first lap yet again just two races later, this time with less severe consequences. Never mention the term ‘always the bridesmaid and never the bride‘ to Rubens Barrichello. During his six season stint at Ferrari he was always very clearly Michael Schumacher’s wingman. Never more clearly than at the Austrian Grand Prix. In 2001 Schumacher fell down the field after a collision with Juan Pablo Montoya. By the final laps he was sitting in third place just behind Barrichello. The Brazilian driver was clearly as fast as the German yet was asked to move over to aide Schumacher’s title charge. He did so on the final corner of the final lap much to the dismay of those watching at home. The following year saw Barrichello’s pride take a much bigger dent. This time leading with a few laps to go, Jean Todt came on the radio to utter the famous ‘Rubens, let Michael past for the championship‘ line for the second year in succession. With Schumacher dominating the title race by an incredible margin it seemed really unfair to deprive Rubens of the win, especially after such a great drive. As it was Barrichello reacted in an identical manner to the previous year and moved over as he went through the final corner on the final lap. Even Schumacher was embarrassed by the shenanigans to the point he insisted Barrichello take the winner’s trophy on the podium. Third placed Montoya clearly didn’t know where to look. Fans were furious, the FIA left red-faced by their own rules and the sport suffered for years as a result. After leaving Ferrari at the end of 2013 to move to Williams, Felipe Massa was in high spirits for the 2014 season. Both he and team-mate Bottas ensured Williams were the best of the rest behind Mercedes in the first half of the season. The highlight was a fantastic pole position in Austria, making him the only man who wasn’t driving a works Mercedes to take a pole all season. It was Massa’s first pole position since the 2008 Brazilian Grand Prix. Sadly he couldn’t hold off Lewis Hamilton and Nico Rosberg on race day, with Bottas undercutting him for the last podium slot. 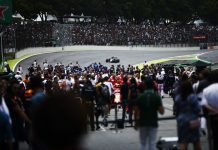 It was scant reward for a flawless weekend from the Brazilian driver. After dominating in devastating fashion in 2002, Michael Schumacher and the Ferrari squad began to feel the pressure in 2003 from a much improved grid. Indeed things got very dramatic during the 2003 Austrian Grand Prix. Schumacher led from the start but was kept in check by both Kimi Raikkonen and Montoya as the race progressed. On lap 23 Schumacher pitted. During the stop some fuel leaked out of the nozzle and onto the incredibly hot bodywork of the Ferrari. It immediately ignited sending the Ferrari mechanics into a flailing panic. Schumacher remained cool as a cucumber throughout. The flames were put out swiftly and Schumacher was on his way, unbelievably still in the top three. 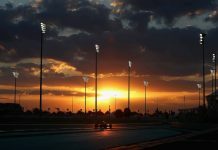 Engine problems for both Raikkonen and Montoya allowed Schumacher to grab an against the odds win which would go on to prove critical for his title charge. Few remember that Alain Prost won the 1985 Austrian Grand Prix. Partly down to the first lap crash that forced the first start to be declared null and void; but also down to the spectacular crash suffered by Andrea de Cesaris on lap 13. De Cesaris got his Ligier-Renault sideways going down into the Panorama Curve. He continued to slide on the grass at frightening speed before hitting a bank. The impact with the bank caused his car to enter a series of horrifying barrel rolls. De Cesaris’ head was seen bouncing around like a rag doll in the cockpit leaving people fearing the worst. Luckily the driver escaped injury free, except perhaps his ego, and mud was smeared on his crash helmet. Ligier owner, Guy Ligier, sacked de Cesaris immediately after the race. It was reported at the time that de Cesaris had told the team, who hadn’t yet seen a replay, that his car had stalled and wouldn’t re-start. Got your own favourite Austrian Grand Prix moment? Tweet them to us @BadgerGP.